Hoarding affects all kinds of people, no matter what their age, gender, or financial status. Though the number of people affected by this disorder is hard to keep track of, since so many people with the disorder resist or do not seek treatment, the American Psychological Association reports that hoarding occurs in around 2-5% of the population. Hoarding is not the same as collecting items such as coins and stamps; collectors pick items for the pleasure of the hobby, and may display their collections. Hoarding is collecting and saving random items of little or no value, often until there are piles of clutter throughout the house. 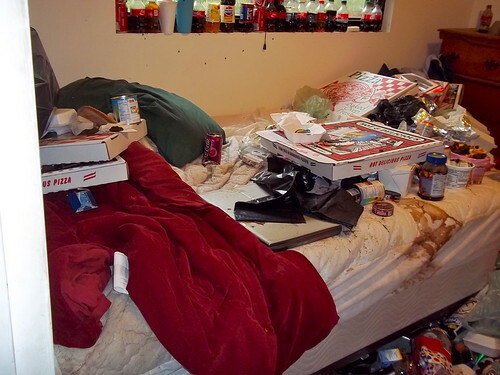 Hoarding is a psychological condition that can begin as early as 13 or 14 years of age. As the individual ages, symptoms typically become worse. A traumatic event in someone’s life, such as death of a loved one, divorce, or any other loss might trigger this disorder, though there is no known specific trigger. Neuroimaging of the brains of hoarders and of people unaffected by the disorder has shown significant differences in certain areas of the brain where higher-level cognitive processing takes place. These areas of the brain are also responsible for decision making and visual recollection, which may help to explain some of the typical behavioral deficits associated with the disorder. Though conclusive proof has yet to be given, there may be a genetic component to the disorder as well. Hoarders tend to stockpile items as a means of feeling in control or feeling comforted; the items may remind them of another time and place, or may simply feel as if they may be useful at some point in the future. There are several hallmarks related to identifying the issue of hoarding. Typical hoarding behavior includes holding onto items of little or no value simply because it would be wasteful to throw them away, keeping many times more items than the individual could reasonably use, avoiding throwing out old or broken items, and an aversion to storing things in appropriate locations such as closets, drawers, or storage bins. In addition to hoarding behavior that is visible only when you have a view into the individual’s living or work space, there are patterns of behavior that could predict a tendency toward hoarding as well. Hoarders will often delay making important decisions for far longer than is reasonable, and may be habitually slow or late in completing basic tasks. Some hoarders find it difficult to manage and organize their daily lives. For them, making firm decisions becomes quite exasperating and so procrastination is the result. Another noticeable symptom for the hoarder is limited social interactions. The person becomes withdrawn from close relatives and friends. This withdrawal from society will only make the situation worse. Some cases of hoarding can be mild or severe. The first sign of hoarding is finding it difficult to discard things that are perceived as being valuable. These early signs indicate that there is a problem. If you have a loved one with these psychological symptoms, it is best to speak with a mental health expert before the situation escalates. The person’s health and safety will be in jeopardy if something is not done soon enough. Joshua Merlin is a freelance writer specializing in moving issues, storage, hoarding behavior and other related topics; those with storage needs in Pennsylvania may benefit from viewing these storage units philadelphia.